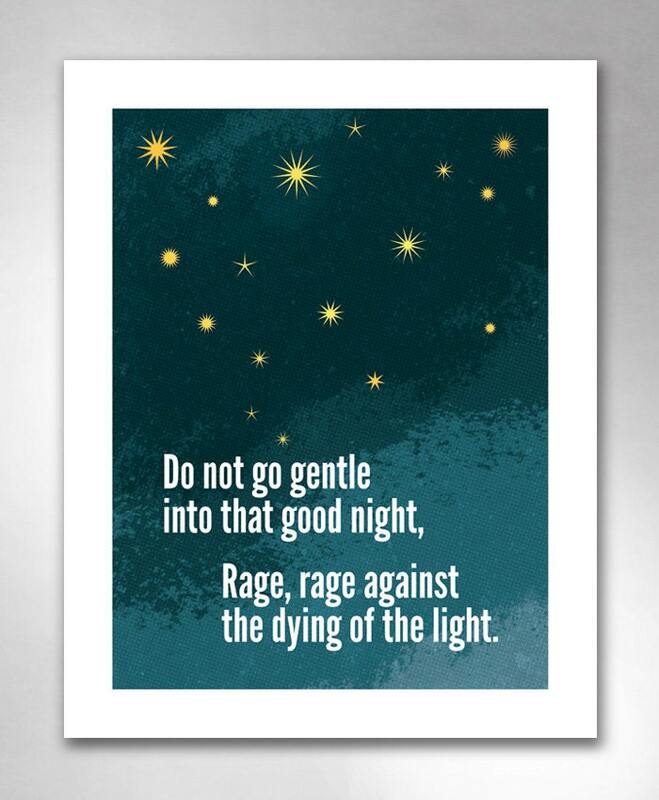 "Do Not Go Gentle Into That Good Night" art print by Rob Ozborne. 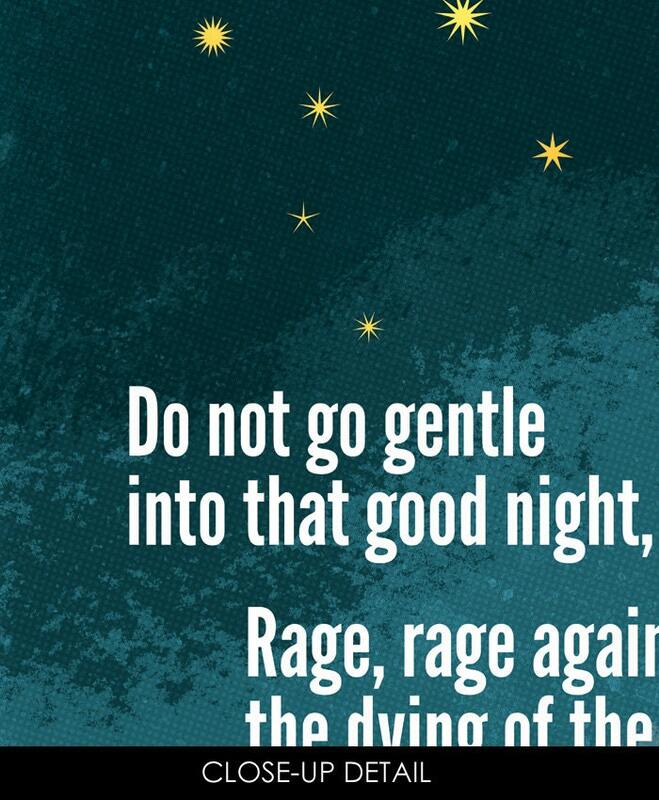 THE STORY: Timeless, inspiring words from Dylan Thomas' poem. For Thomas, the poem was a plea. His aging father was losing his eye sight and growing frail, so he penned the words "rage against the dying of the light". He desperately wanted his father to remain passionate, vibrant, and to continue to fight. THE PRINT: The artwork is richly printed on bright white matte art paper. The frame is not included, but the print comes with a white border, and is ready to pop into a frame. THE ARTIST: Designed and drawn by Rob Ozborne, each print is hand-signed. SHIPPING & HANDLING: Great care is taken in preparing your print. Placed in a protective archival sleeve, gently rolled and well packed, your artwork ships in a sturdy tube. Looking for the black and white edition of this print? Find it here! Pay by credit card or PayPal, the choice is yours. All purchases are shipped First Class via USPS within 1-2 business days. Items are always handled with the utmost care, carefully packaged and well protected for shipping. I want your art print to arrive safely and without blemish! For international orders, please allow 1-2 weeks for delivery. Customs sometimes causes additional delay, but not usually. International buyers are responsible for any and all additional taxes or fees due to Customs. Unfortunately, tracking is not available for international orders. If you ever have a question about your item or delivery, just message me. Always happy to help. If for any reason you should desire a refund within a week of receiving your item, message me. If damage occurs during shipping or there's another issue, I am always happy to make it right. The only exception is Custom Orders. No returns, please. Do you have a special request? Custom orders, wholesale and consignment requests, and other questions are welcome. Just convo me, please. If you like what you see in my shop, word of mouth (or keyboard) is always appreciated!